Anna Alma-Tadema (1867–1943), The Idler's Harvest (1900), oil on panel, 35.5 × 24.7 cm, location not known. Wikimedia Commons. When writing about Sir Lawrence Alma-Tadema, I mentioned that one of his daughters also became a professional artist, and promised to give an account of her life and work. Here it is. Lawrence Alma-Tadema (1836–1912), This is Our Corner (Portrait of Anna Alma Tadema (1867-1943) (front) and Laurense Alma Tadema (1865-1940)) (1873), oil, 56.5 x 47 cm, Van Gogh Museum, Amsterdam. Wikimedia Commons. Anna Alma-Tadema (1867–1943) was the younger of the two daughters of Sir Lawrence, by his first wife. She was born in Brussels, Belgium, and moved with the family to London at the outbreak of the Franco-Prussian War in 1870, just a year after her mother’s death. She seems to have been schooled at home, and was probably taught to paint by her father and step-mother (who was also an accomplished artist, and will be covered in a future article too). 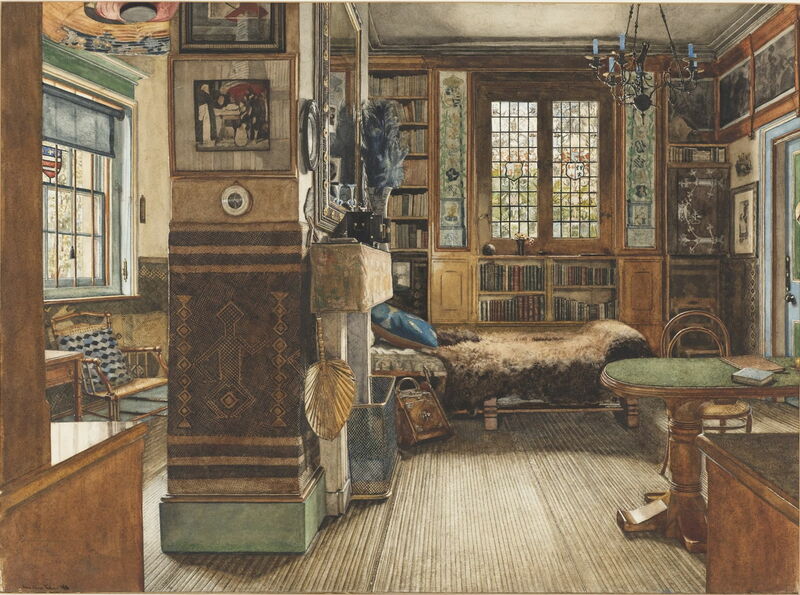 Anna Alma-Tadema (1867–1943), Sir Lawrence Alma-Tadema’s Library in Townshend House, London (1884), watercolor and gouache, pen and ink, graphite on white paper, dimensions not known, Cooper Hewitt, Smithsonian Design Museum, New York, NY. Wikimedia Commons. Anna was a precocious and brilliant painter in watercolours, and her earliest surviving works, made when she was only seventeen or eighteen, document the interior of the family home near Regent’s Park, London. Sir Lawrence Alma-Tadema’s Library in Townshend House, London (1884) is a meticulously-detailed account of that room, even down to the details of its stained glass. Anna Alma-Tadema (1867–1943), The Drawing Room, Townshend House (1885), watercolor, pen and Indian ink over pencil on cardboard, 27.2 × 18.7 cm, Royal Academy of Arts, London. Wikimedia Commons. 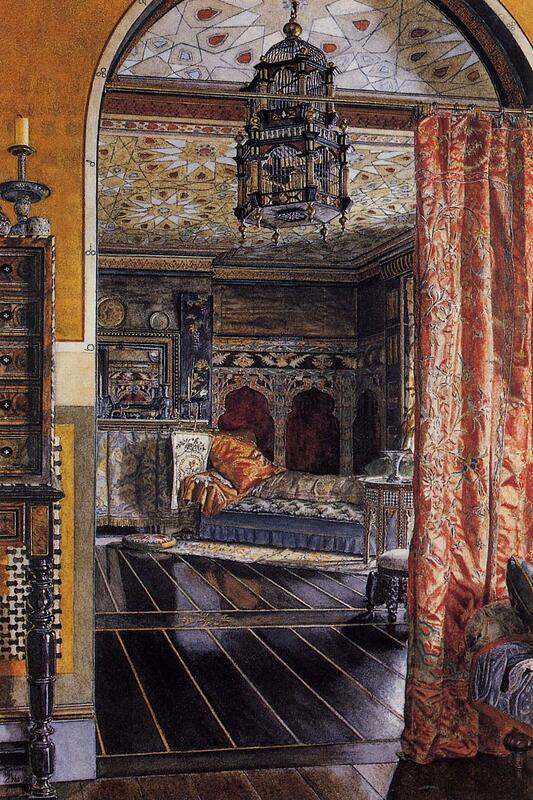 Her small watercolour of The Drawing Room, Townshend House (1885), painted the following year, shows her improved skills at depicting surface light and texture. This painting was exhibited at the World’s Columbian Exposition in Chicago, in 1893, a remarkable achievement for someone who was only eighteen at the time that it was painted. Anna Alma-Tadema (1867–1943), Eton College Chapel (c 1886), watercolor and gouache, 52 × 36 cm, Private collection. Wikimedia Commons. 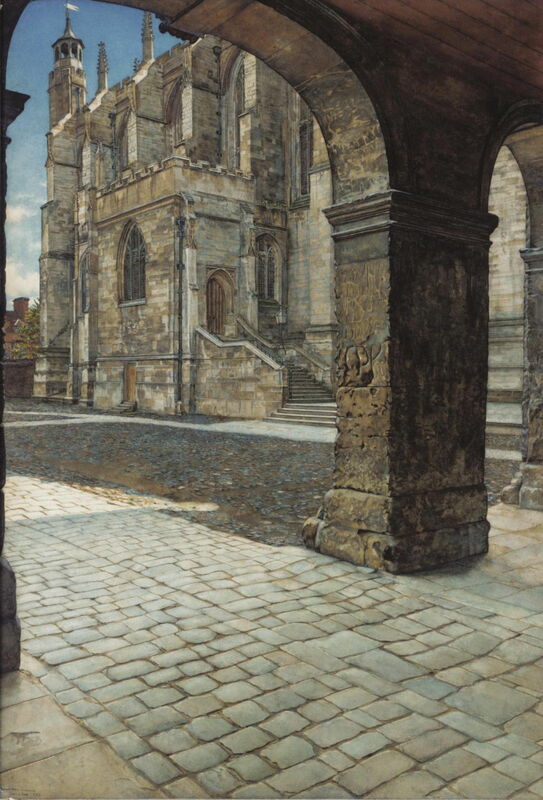 The following year, she painted this view of the exterior of Eton College Chapel (c 1886), again in watercolour, which was exhibited at the Royal Academy that summer. 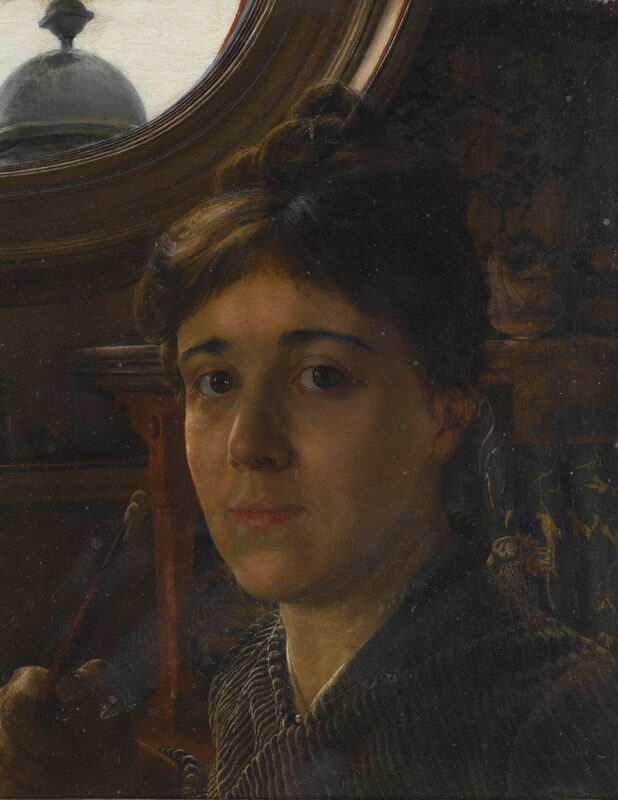 Anna Alma-Tadema (1867–1943), Self-portrait (c 1887), oil on panel, 28 × 23 cm, Private collection. Wikimedia Commons. This Self-portrait was one of her early oil paintings, and probably dates from around 1887, or perhaps slightly later. Its rather puzzling background is another part of the family home, by then in Saint John’s Wood, to which they moved in 1886. It is believed that this too was exhibited at the World’s Columbian Exposition in Chicago, in 1893. She appears to have painted more in oils towards the end of the nineteenth century, and to have undergone a dramatic change in genre and style. Anna Alma-Tadema (1867–1943), The Idler’s Harvest (1900), oil on panel, 35.5 × 24.7 cm, location not known. Wikimedia Commons. The Idler’s Harvest (1900), which was exhibited at the Royal Academy in 1900 (although some sources claim it was 1898), is radically different from her previous work. 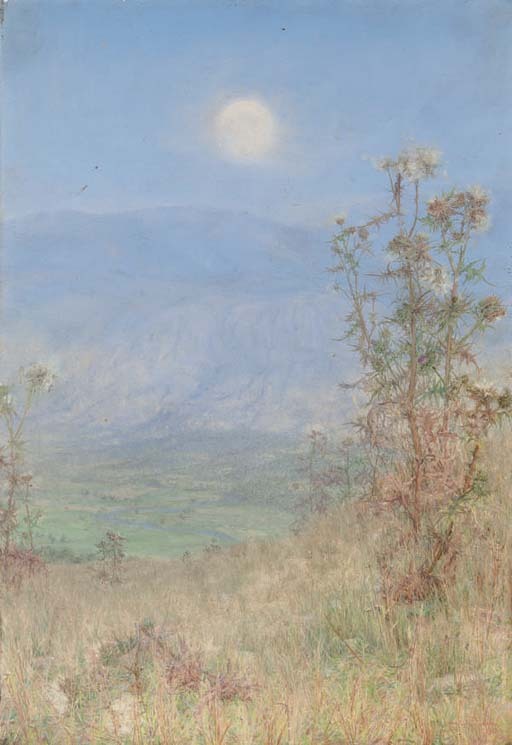 A landscape painting in oils, it adopts a more Impressionist approach, showing a valley and distant hills, but retaining her fine detail in the weeds in the foreground. Anna Alma-Tadema (1867–1943), Girl in a Bonnet with her Head on a Blue Pillow (1902), watercolor on paper, 36.6 × 26.4 cm, Ashmolean Museum, Oxford. Wikimedia Commons. 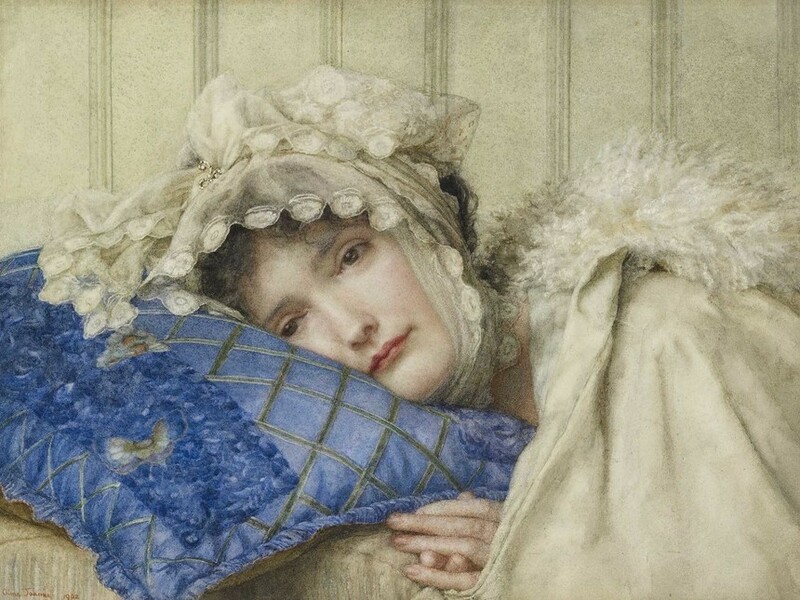 Girl in a Bonnet with her Head on a Blue Pillow (1902) is a touching watercolour which explores the sadness of a woman’s face and hands, as she rests her head on a blue cushion. That is the latest painting of hers which I have been able to locate, although it is known that she continued to exhibit at the Royal Academy until 1928. Following the death of her father in 1912, the value of his paintings collapsed, plunging both daughters into poverty. Neither ever married, but Anna continued to make a frugal livelihood from her paintings, which all seem to have vanished. 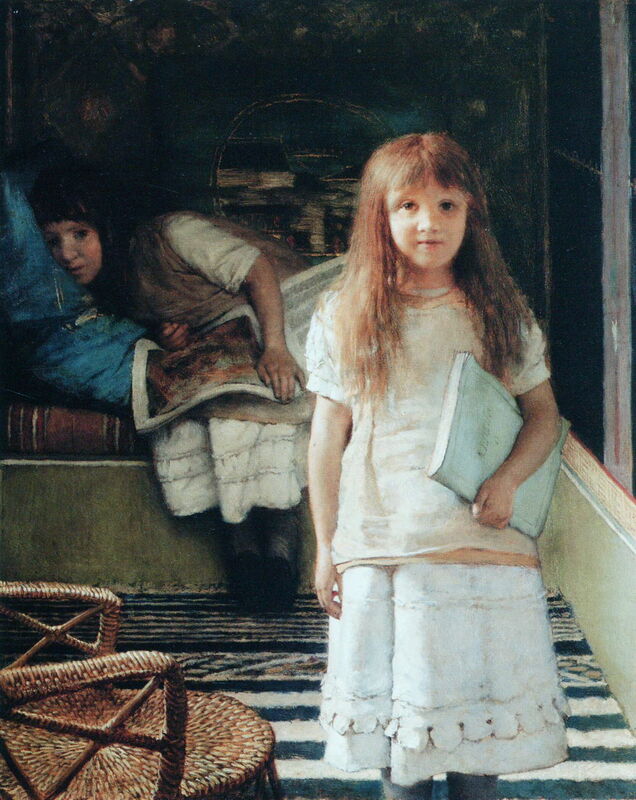 Posted in General, Painting and tagged Alma-Tadema, painting, women in art. Bookmark the permalink.